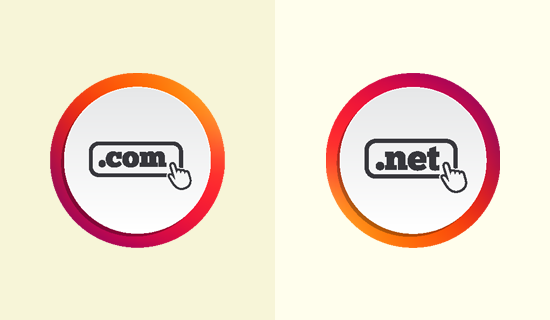 We are often asked by our users about .com vs .net domain name extensions. Choosing a domain name is extremely important for your business goals because it can have an impact on your branding and search rankings. 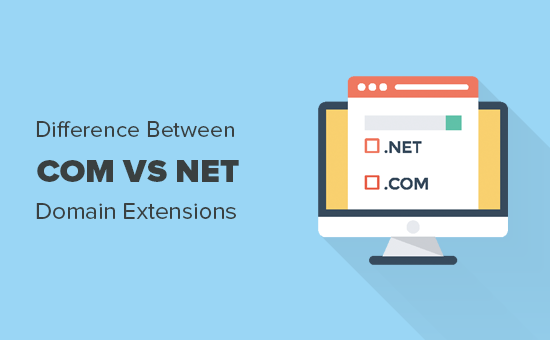 In this article, we will explain the difference between Com vs Net domain extensions and which one is better for your website. What is Com and Net Domain Name Extensions? To learn more about domain names, see our beginner’s guide on what is a domain name and how do domains work. Domain names come in various extensions like com, net, org, and more. You can freely choose a domain name from any of these extensions to make a website. However, these extensions were created to distinguish between different types of websites. You need to choose a domain name extension that fits your business while helping you build a recognizable brand and authority in your industry. That being said, let’s compare the difference between .com vs .net domain extensions to see which one is better for your business. Com and Net are two of the most popular domain name extensions. If your preferred dot com domain name extension is not available, then many domain name generator tools will suggest .net as the alternative. However, it is not a suitable alternative for your business in most cases. COM in the .com domain name represents commercial domain names. This includes all business websites, websites that want to make money online, personal websites, blogs, portfolios, and almost anything in between. On the other hand, the NET in the .net domain name extension represents “network”. It is recommended and suitable for internet, email, and networking service providers. When You Should Choose a COM Domain Name? The .com domain extension has become synonymous with the internet. Nearly 46% of all registered domain names are .com domains. This is why it is way easier for users to remember a .com domain name than any other domain extension. Due to the popularity of .com domain names, they are also easier to brand, promote, and help you grow your business. If you want to make any kind of business website, then you should always use a .com domain name extension. It gives your website a familiar address and makes your business look more professional and established. Now the problem is that .com domain names are so popular that it feels like all good ones are already taken. However, there are still plenty of clever ways to get the perfect .com domain name. Here are some tips on choosing the best .com domain name. Make sure your domain name can be easily pronounced. Don’t use hyphens or numbers in your domain name. Take advantage of online domain name generators. These free tools will help you come up with clever domain name ideas that are unique and still available. Need more help? See our article on how to choose the best domain name for your website with practical tips and real examples. When You Should Use Net Domain Extension? You should use .net domain name if you are going to offer internet, networking, database hosting, email hosting, or similar services. You can still use a .net domain name if it suits your brand. However, you will need some serious marketing talent to pull this off. For example, Behance.net is a popular online design community which successfully uses a .net domain extension for their website. It suits them because they wanted to be a network of artists, designers, and companies looking for talent. Nearly 4% of all domain names registered are using the .net domain extension. Domain name registrar’s started presenting .net and other domain name extensions as an alternative to .com, which may give you an impression that it is more commonly used than it actually is. Originally, it was supposed to be a domain name extension for internet and networking service providers. Many real and well-known internet companies still primarily use their .com domain name for the business. For example, visiting comcast.net will take you to their new .com website. Now, you may think 4% is quite a lot of domain names (around 14 Million at the time of writing this article). Who else is using .net domain names? Many businesses register a .net domain extension for their brand so that someone else couldn’t infringe on their business name. Some companies started using it because they couldn’t get their preferred .com domain name. Majority of these companies soon transfer to a .com domain extension but they keep .net domain name for technical and legal reasons. Com vs Net – Which One is Better for SEO? A lot of our users ask us which domain extension will help them rank higher. If you are asking between Net and Com, then choosing either of them will not affect your SEO. Search engines will treat both domain extensions the same. You will need to just focus on SEO best practices and create useful targeted content to rank higher. The actual important part will be your domain name itself, not the extension. For example, stargardeningservices.com will rank better than starservices.net because it contains the keyword that people are more likely to search. There are two ways to get a domain name. You can choose the one that best suits you. If you want to make a website then you will also need website hosting. See our article on the difference between domain name and website hosting. Usually, you will pay $14.99 per year for a domain name and $7.99 / month for hosting. Now, if you are just starting out, then this sounds like a lot of money. Luckily, folks at Bluehost are offering WPBeginner users a free domain name and 60% discount on hosting. If you don’t want to make website, then you can still register a domain name and make a website later. We recommend using GoDaddy. They are the largest domain name registration company in the world currently managing 72+ million domain names. For detailed step by step instructions, see our article on how to register a domain name. We hope this article helped you learn the difference between com vs net domain name extensions. You may also want to see our step by step guide on how to start a blog. The post Com vs Net – What’s the Difference Between Domain Extensions appeared first on WPBeginner. Ephox, Creators of TinyMCE, Rebrand to Tiny Technologies Inc.